The teams were graded on their layout, programming, use of interior space, and their habitat's ability to be scaled to full size for construction, according to a NASA statement announcing the winners. The groups also received points for their aesthetic representation and realism. Team Zopherus – Rogers, Arkansas – Awarded $33,422.01: This is a design inspired by biology, with various pods for crew habitation. A landing module would become the base habitat by dropping to the ground and forming a seal, which would allow a pressurized environment for printing. From there, rovers would pick up Martian regolith (soil) and bring it back to the habitat to create aggregate cement, made up of Martian carbonates and water. This mixture would be combined with highly recyclable thermal plastic to create habitat walls. 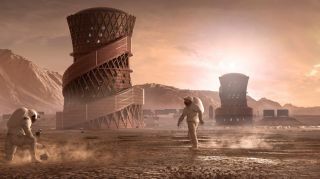 Because concrete can fracture during Martian temperature swings, the outer surface has a shading system (oriented towards the sun) to shield portions of the shell from the sun's heat, reducing the incidence of cracks. The habitat includes a communal unit with a suit airlock, hydroponic gardens, four bedrooms for crew, a laboratory module, and rover hatches — and can be expanded as needed to meet the demands of research and crew. Winning first place in the Phase 3: Level 4 software modeling stage of NASA's 3D-Printed Habitat Challenge, Team SEArch+/Apis Cor presented a uniquely shaped habitat with constant support across the structure and many openings for natural light to shine through. In the Phase 3: Level 4 software modeling stage of NASA's 3D-Printed Habitat Challenge, Team Zopherus took home second place. The team presented a design created by a roving, autonomous printer moving from site to site after completing a structure. In NASA's 3D-Printed Habitat Challenge, Team Mars Incubator garnered third place with their design by a group of engineers and artists. The competition's final phase will happen between May 1 and May 4, 2019, when participating teams will present their structural print (which is smaller than the real thing, but still to scale) and compete for an $800,000 prize.